We serve select business owners, executives, and high net worth families. Our team will assist you in defining your financial goals; developing a plan to help attain these goals; assist in implementing the plan; and monitor your progress over time. We understand that this is an ongoing process, and not a quick analysis with instant solutions. Our approach is to take a long term perspective and treat it as an ongoing process. 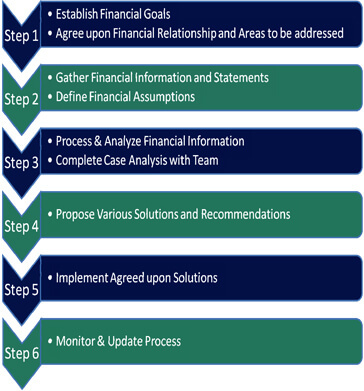 Financial planning is the process of meeting your life goals through the proper management of your finances. Life goals can include buying a home, saving for your child’s education, or planning for retirement. The financial planning process consists of six steps that help you take a “big picture” look at where you are financially. Using these six steps, you can work out where you are now, what you may need in the future, and what you must do to help reach your goals. The process involves gathering relevant financial information, setting life goals, examining your current financial status, and coming up with a strategy or plan desgined to meet your goals given your current situation and future plans.